Hi guys! I've decided to introduce a new series to my blog, and I hope you guys will enjoy this one! As you guys probably know/have guessed, as a beauty blogger I receive a ton of products to review. I prefer to feature products in themed posts, but sometimes certain products don't fit within a theme, and sometimes other products didn't work for me, but I want to be able to share why they didn't work, and perhaps help you decide what products to buy depending on your skin type. So I decided to start this series, sharing with you guys the latest products to hit the shelves (and my desk!) and my opinion of them! This first post might be a little long, but I'll try to keep the next posts in this series to about 4-5 products. 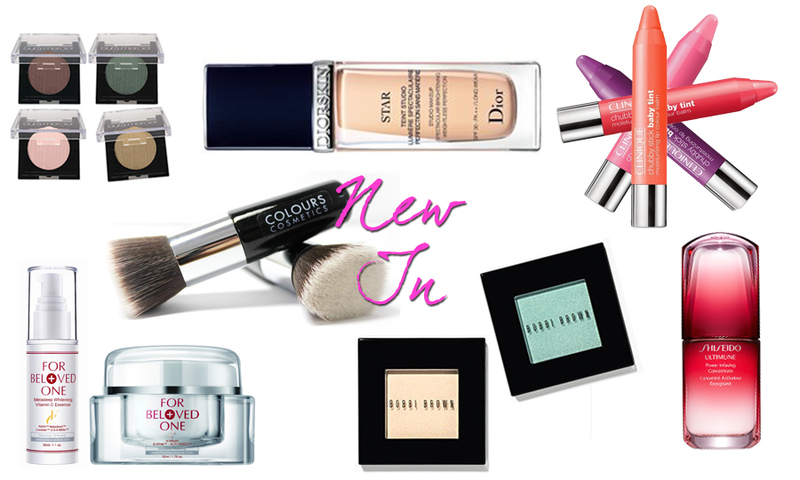 So here goes - products brand new to me and in stores in October! Laura Mercier's Fall collection this year is beautiful and as its name suggests, sensual. The brand has injected gorgeous plums and greens into this collection, and I love the amazing eyeshadows in this collection. I was only able to try one of their eyeshadows - the Satin Matte Eye Colour in Gold Seduction - and I love it! It is a rustic, almost olive/bronze gold with shimmery gold flecks in it. Its texture is very soft and buttery, and it is very pigmented, which is something that I love about it. All I need to do is apply a few swipes and then blend. The colour is so flattering on my skin, and I think it can be super flattering on other warm skin tones as well. At the Laura Mercier Sensual Reflections event. Both colours are quite similar, though you can see a more plummy undertone in Flowering Freesia, and a more pinky tone to Budding Blossom. I think this is something that I would have loved back in high school, for its natural colour and moisturising properties. My favourite of the two is Budding Blossom, because it's such an uplifting, brightening colour. If you're looking for a lip balm that can give you a little colour for school, or if you're new to makeup and don't want to make the leap to full-coloured lipsticks, then this is definitely the product for you. Colours Cosmetics is a Malaysian brand, and they have released a lovely, short-handled kabuki brush made for applying foundations and powders. I received this to trial a few weeks ago, and in trialling this, I have come to discover that my favourite way to use it is as a powder applicator. This allows me to pack on powder where I need it (on my T-zone, to absorb oil), without having my skin look too cakey. The short handle also helps when you want to get close to the mirror to apply your foundation. I've knocked my brushes against my mirror one too many times, so I appreciate a shorter handle when I can get it! For Beloved One is a Taiwanese skincare brand, and I have really been enjoying trialling their products! My absolute favourite by far is their SPF50 Sunscreen, which is tinted and provides excellent coverage, plus a bonus, extremely glowy, dewy finish. Also on my list is their Melasleep Whitening Essence, which has helped me reduce the appearance of my acne scars. I love pastel eyeshadows, because they can brighten up any eye look. I tried the colours Pistachio (a light, pastel satiny green), and Berry Sorbet (a shimmery pink) and though the pink didn't stand out (I'm not a fan of pink eyeshadow), the green certainly did! I love putting this in the inner corner of my eyes to brighten a neutral smoky eye look. Just remember to lay down a white base (my favourite is the NYX Eye Pencil in Milk) before applying your pastel eyeshadow, because it's really going to help the colour pop! This amazing serum is the result of decades of research in the Shiseido labs, and after months of trialling, I can finally say that that effort has most definitely paid off. This serum was formulated with the aim of providing the skin with ultimate immunity, hence the name 'Ultimune'.When I first started trialling this serum, I wasn't quite sure it was effective. I started it right before a bout of travelling, which didn't help things because I started breaking out and this serum didn't seem to be doing anything to help that. Fast forward almost two months, and I can see why it is such a highly celebrated release. My skin is luminous and healthy (though admittedly, I am still breaking out here and there!). A huge zit that I had on my cheek is just starting to disappear, and I feel like the time it took, and the way in which it started to disappear, was much shorter and less harmful to my skin. My overall skin condition is better than ever in terms of firmness, luminosity, and smoothness. I am very impressed!